OMAHA, Neb. 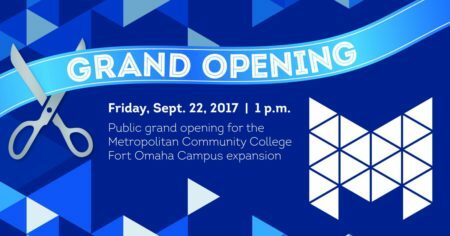 — Metropolitan Community College will host a grand opening celebration for three new buildings on the Fort Omaha Campus on Friday, Sept. 22 at 1 p.m. The ribbon cutting ceremony will take place at the outdoor amphitheater on the south end of the Fort Omaha Campus, 32nd Street and Sorensen Parkway. The event will feature remarks from College, state and local leaders, as well as tours of each of the new buildings. 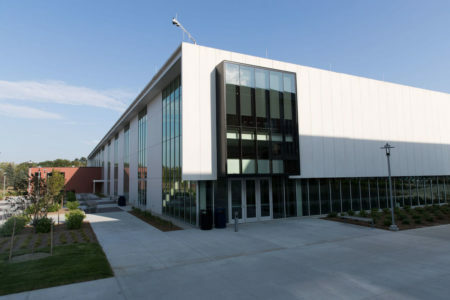 The grand opening highlights a new era of investing in students and communities via the Fort Omaha Campus, which includes new, innovative approaches to learning in the Center for Advanced and Emerging Technology, the Construction Education Center and the Career and Academic Skills Center. The $90 million project is a public/private partnership designed to build a strong regional workforce, keep higher education close to home and respond to area business trends. In the new centers, students will learn the skills for today’s jobs, prepare them for tomorrow’s jobs and provide them with resources and opportunities for a lifetime of learning. “The Fort Omaha Campus grand opening celebration represents the culmination of more than seven years of planning and preparation. That accomplishment is worth celebrating. But what we especially celebrate as we open these new buildings is the purpose behind all that planning, which is to provide a first class education to empower the potential in people, whether they are right here in the neighborhoods surrounding the Fort Omaha Campus, from greater Omaha or living throughout our four-county area. When potential is unlocked through training and education, families and businesses thrive and our whole region benefits,” said MCC president Randy Schmailzl. News Release. MCC asks that guests park on the south end of campus or on the north end of campus, where shuttles will provide transportation to the amphitheater. The grand opening celebration is free and open to the public. The Omaha area takes big steps forward this week on the workforce development front — by launching a local initiative to encourage women in technology fields and by unveiling a set of buildings at Metropolitan Community College offering cutting-edge training in the construction trades and advanced manufacturing. The kickoff today for the STEP Forward initiative salutes 60 women in technology fields (Science, Technology, Engineering, Production) in Nebraska and western Iowa. Continue reading. This entry was posted in Nebraska / Midwest News, NewsBlog and tagged Center for Advanced and Emerging Technology, Fort Omaha Campus Expansion, Grand Opening at MCC's Fort Omaha Campus, MCC's STEP Forward Initiative, Nebraska's workforce development, Omaha World Herald on September 21, 2017 by Helen Deffenbacher.